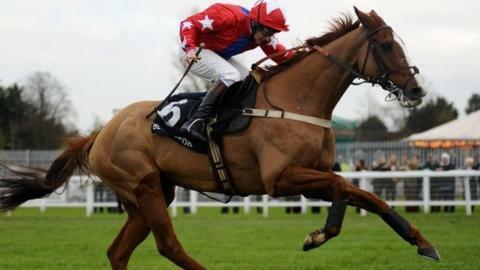 Trainer Gary Moore earned his first Grade One win as son Jamie rode Sire De Grugy to land the Tingle Creek Chase. Moore junior was forced to switch wide turning for home at Sandown on the 7-4 joint-favourite. But he soon passed fellow market leader Captain Conan, eventually going clear from the running-on Somersby (4-1) to win by four lengths. In the Becher Chase at Aintree, Chance du Roy (14-1) won from the gallant Baby Run over the Grand National fences. The 13-year-old Baby Run, trained by Nigel Twiston-Davies, had won the Fox Hunters' Chase over the famous obstacles in April 2011, but was racing for the first time in 959 days. Rebel Rebellion, part of a five-timer across the Sandown and Aintree cards for trainer Paul Nicholls, won the Grand Sefton Chase over the National fences but Plein Pouvoir, trained by Venetia Williams, suffered a fatal injury. At Sandown, winning jockey Jamie Moore, the brother of three-time champion Flat rider Ryan, said: "I'm delighted for my dad. "For me personally it is my best achievement, there was a bit of pressure as we love him to pieces." Distances: 1 length, 1¾ lengths, 4½ lengths Winning trainer: P J Hobbs.